Photo of tiger caught on camera trapA geographic profiling tool used to catch serial criminals could help reduce the casualties of human-tiger conflict, according to scientists who collaborated on an innovative conservation research study. Dr Matthew Struebig at the University of Kent and Dr Freya St. John at Bangor University’s School of Natural Sciences, led a collaboration between spatial ecologists and social scientists to help predict where human-tiger conflict interventions could be most effective. 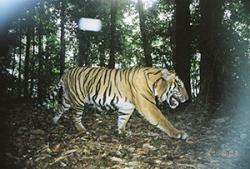 Tigers are on the brink of extinction due to deforestation and persecution. They are highly threatened and pose a public threat, but in Sumatra tigers continue to coexist with people, offering insights for managing dangerous wildlife elsewhere. Millions of conservation funds are spent each year trying to reduce people’s risk of encountering harmful animals, and mitigating livestock losses of local farmers. To reveal the drivers of human-tiger conflict the team coupled spatial analyses of tiger encounter risk with information from 2,386 Sumatrans who were asked about their tolerance of wildlife. To map risk, the study used 13 years of human-tiger encounter records to generate a geographic profile – a sophisticated statistical technique previously used throughout the world to predict the whereabouts of serial criminals based on where their crimes have been committed. Although the risk of encountering a tiger was generally greater around populated villages near forest or rivers, the geographic profile revealed three places where risk was particularly high. At the same time questionnaires revealed that people’s tolerance for tigers was related to their underlying attitudes, emotions, norms and spiritual beliefs. By combining this information, the team was able to highlight villages where risk was adversely high, and tolerance was unusually low – valuable guidance for organisations such as Fauna & Flora International, an international conservation charity that supports the Indonesian authorities and other in-country partners in Sumatra, helping them to prioritise conflict interventions. The techniques used in this study are highly significant and open up new possibilities for more targeted actions that will not only boost efficiency, but – more importantly – ensure that fewer people and tigers come to harm as a result of their interactions. This research has shown for example that, had this information been available at the time, pre-emptive interventions using these predictions could have averted up to 51% of attacks on livestock and people, potentially saving 15 tigers. The research published in Nature Communications, also provides further evidence of the benefits of interdisciplinary research on such conservation conflicts. Addressing human-tiger conflict using socio-ecological information on tolerance and risk by Matthew Struebig, Nicolas Deere, and Jeanne McKay, all University of Kent; Matthew Linkie, Wildlife Conservation Society Indonesia; Betty Millyanawati, Fauna & Flora International Indonesia; Fachruddin Mangunjaya, Universitas Nasional Indonesia; Sally Faulkner and Steven Le Comber, Queen Mary University of London; Nigel Leader-Williams, University of Cambridge; and Freya St. John, University of Kent and Bangor University.